Auld, A. Graeme. 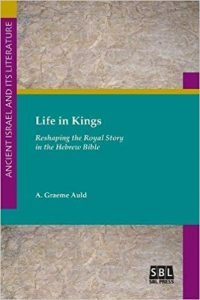 Life in Kings: Reshaping the Royal Story in the Hebrew Bible. Atlanta, GA: SBL Press, 2017, viii + 321, $39.95, paperback. A. Graeme Auld is Professor Emeritus of Hebrew Bible at Edinburgh University. He is the author of numerous books and articles, including I and II Samuel: A Commentary in the Old Testament Library series (WJK, 2011) and Kings without Privilege: David and Moses in the Story of the Bible’s Kings (T & T Clark, 1994). Life in Kings opens with a statement about the focus of the book, a history of interpretation, and two brief case studies that start the argument of the book. Auld opens by stating Life in Kings “is about writing and rewriting the biblical book of Kings—it is a book about words and their use and their reuse, about meanings and changes in meaning . . . our principal concern is with the words themselves” (p. 1). After this thesis Auld summarizes the works of “the Fathers” who have explored the compositional history of Kings (as well as Samuel and Chronicles). These include de Wette, Wellhausen, and Noth from previous generations and also some more recent scholars. After tracing his own progression in scholarship and thought over a series of papers Auld ends the chapter with two case studies. One of the presentation of Hezekiah in Kings and Isaiah and the other a comparison of the material in Samuel and Chronicles of David in Moab. Chapters 2-5 is where Auld amasses material from Samuel and Kings that is different in nature, particularly in the use of words (and their meanings). Chapter 2 begins after a discussion of the presentation of David in Moab where the ideas/words of life and death were important within the narratives. Auld starts with a discussion of the “word cluster” life/live/living (היים/היה/הי). Auld notes where this cluster is present and absent in Kings, Chronicles and Isaiah and then looks at a variety of expressions and other uses of this word cluster (swearing by the living Yahweh, the life of the king, and discussion of such things as animal life). The content of chapter 2 forms the basis for the title of the book. Chapter 3 surveys other words within Samuel-Kings and Chronicles where he differentiates between word usage in synoptic Samuel-Kings and nonsynoptic Samuel-Kings. In chapter 4 he continues by looking at communication between God and the king. Chapter 5 focuses on the cult within the synoptic material surveying such things as the building of altars, the high places, etc. In chapter 6 Auld ends this section of the work by beginning of proposal of a synoptic narrative. He notes that this “reconstruction can only be provisional and incomplete” (p. 89). Here he seeks to answer three questions related to distinctiveness, coherence, and meaning (see the full questions on p. 90). Chapters 7-9 develop Auld’s theory of the Book of Two Houses, which he has espoused in other writings. Chapter 7 focuses on the shared text(s) as presented in 1-2 Samuel. Chapter 8 focuses on the examination of prophets and prophetic material in Kings. Chapter 9 looks at the kings as they are presented in the synoptic and nonsynoptic material with a particular focus on the writing and rewriting of Judah’s kings. Chapter 10 brings in further information from the book of Isaiah on Hezekiah, though this material had been mentioned in passing elsewhere in the work. Chapter 11 answers questions that the earlier “probings” of parallel material anticipated. This includes a discussion of “serial anticipations” where he believes that the authors “retrojected themes back into earlier times” (p. 194) and a discussion of the book of Deuteronomy as “the big anticipation” (p. 195). The book ends with a detailed presentation of samples of the shared Hebrew text. I have found the great value to this book to be Auld’s exhaustive combing through the text to find the very nuanced differences in presentation between Samuel, Kings, Chronicles, and Isaiah. It is clear that Auld has spent a lifetime of study contemplating the material, with which he is expertly familiar. His reconstruction and presentation of the synoptic material in chapter 12 is thorough. His identification of both similarities and differences between texts is very helpful for literary considerations on why each author chose specific material, and what this could mean for the overall narrative. This, however, is not ultimately what Auld intends to do with his data. Instead of a synchronic reading of the text, Auld’s diachronic analysis is focused more on understanding concerns of textual strata and authorship, which is a literary criticism of a different type. This book will be helpful to the very advanced student, and Old Testament scholar, familiar with higher critical theory.